Choice Carpets - Quality Carpets, Rugs, Remnants, Vinyl and Laminate Flooring based in Bristol. Vinyl is the least expensive flooring option on it's low end and competitive with hardwoods and linoleum at its higher range. As with everything else, you get what you pay for. On the low end, vinyl is relatively thin with a shallow wear layer over a felt or vinyl backing. A pattern is printed on its surface using a rotary printing technique called rotogravure; hence, the moniker rotovinyl. The top layer is clear vinyl. It may seem brittle or stiff and could be subject to breaking or tearing. Its life expectancy is relatively short—usually less than ten years depending on traffic. Higher quality sheet vinyl often has color throughout, not just printed on. The wear layer is typically much thicker and may be warranted for up to 30 years depending on the manufacturer. It repells dirt, is scuff resistant, and takes considerably more abuse. Because it is thicker, it's also much heavier. As a result, it's advisable to consider hiring a professional installer to make sure it's properly installed. Vinyl flooring comes in sheets or tiles. Felt-backed which requires glue all over the floor, and vinyl-backed, which is secured to the floor by gluing just the edges. The felt-backed vinyl, once secured to the floor, stays put. If you want to replace it, prepare for an arduous scraping job or simply apply new vinyl over the top. The vinyl-backed is easy to replace, just break the seal along the edges and rip it out. However, if the glued edges come unglued you can easily tear up your floor moving heavy appliances like refrigerators across it. Peel and stick tiles are available with the glue on the back. All you do is peel the paper off, position the tile, and press it on. These are incredibly easy to install with a minimum of fuss. The major caveat is making sure the surface is clean and smooth to ensure a tight, flawless fit. Other tile require application of a glue adhesive to the floor, then placement. 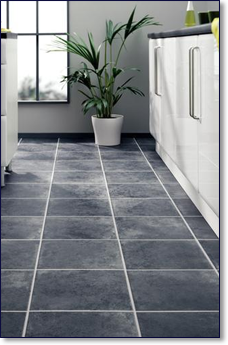 Tile is particularly suited to do-it-yourself projects because it is much more manageable than sheet vinyl. Sheet vinyl is something that a motivated homeowner can install using a paper template to create the shape. Following the manufacturer's instructions is essential to success. Vinyl floors are known for their ease of maintenance. Sweeping or using a dustmop is often all that is needed on a daily basis. Depending the visibility of dirt and your tolerance for it, you might use a damp mop daily or weekly. Never use abrasives of any sort on your vinyl floor. It destroys the wear layer on top and leaves ugly marks you'll never be rid of. The primary advantages of vinyl are that it's relatively inexpensive and available, and comes in an almost infinite variety of colors and patterns. Maintenance involves little more than sweeping and damp mopping. Because it is moisture resistant, it can be ideal for bathrooms and kitchens. Sheet vinyl is used extensively in bathrooms. Sealed, it is completely impervious to water. The origins and life cycle of vinyl are its primary disadvantage. Because it is produced from petroleum products, vinyl (also known as polyvinyl chloride or PVC) is considered the worst plastic from the perspective of green building and environmental health. Vinyl manufacturing creates poisonous byproducts including dioxin, an extremely carcinogenic toxin. It can't be recycled. If it is incinerated at the end of its life cycle, it releases more dioxin. Consider the variety of healthy alternatives before purchasing vinyl. Laminate flooring was invented in 1977 by Swedish manufacturer Pergo. The company initially marketed its product to Europe in 1984, and later to the United States in 1994. Pergo may be the most widely known laminate flooring manufacturer, but the trademark name is not synonymous for all laminate floors, just as Scotch is not synonymous with all clear tape and Jacuzzi doesn’t make all hot tubs. 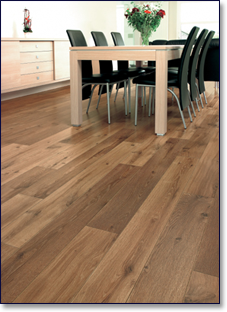 Made of laminate material, laminate flooring is designed to look like natural products, such as wood or stone. It is comprised of either synthetic materials (usually melamine resin) or of synthetic materials combined with natural and recycled ingredients. The natural look is achieved with an attached decorative applique and finally given an aluminum oxide finish. Laminate floors are fairly low-maintenance when compared to hardwood floors. Unlike natural wood, laminate floors do not require waxing, oiling or staining. It is important to keep laminate clean, however, as dust, dirt and sand particles may scratch the decorative surface in high-traffic areas over time. It is also important to keep laminate relatively dry. Sitting water/moisture can cause the planks or tiles to swell or warp. Many new finishes are equipped with water-resistant coatings. Water spills aren't a problem if they're wiped up quickly. Adhesive felt pads placed on the feet of furniture on laminate floors prevent scratching. Laminate floors are usually far less expensive than wood or natural stone floors and are a reasonable solution for a do-it-yourself homeowner to install. 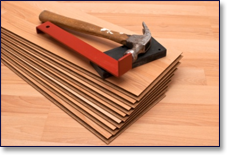 Laminate flooring possesses a monolithic function once each plank or tile is clicked into one another, without the use of glue, staples, nails, or cement compounds. Installed laminate floors typically "float" over the sub-floor on top of a foam/film underlayment, which is meant to provide moisture and sound-reducing properties. © 2019 - Choice Carpets. All rights reserved.